While Star Wars has amassed a following that spans decades, there’s always been a generational gap between parents who grew up with the original trilogy and children who might have had their first exposure to Star Wars through the new sequel trilogy films. 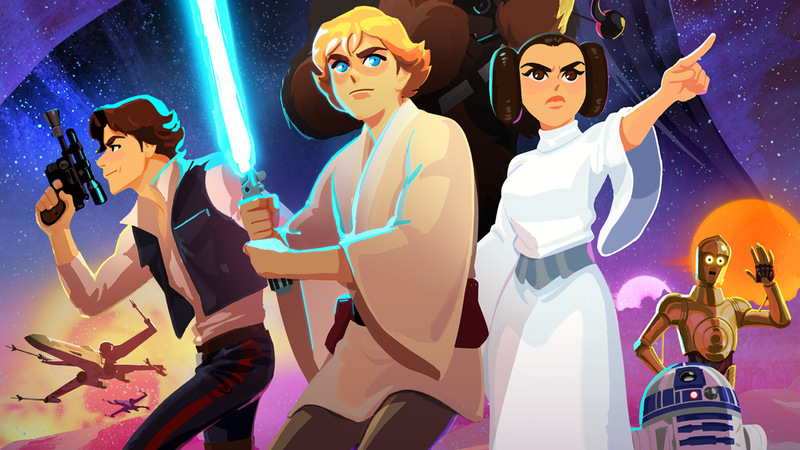 But it looks like that’s about to change, as Lucasfilm is working to help acquaint children with what their parents loved about the original trilogy by debuting a new series of shorts entitled, Star Wars Galaxy of Adventures, exclusive to the Star Wars Kids website. While the shorts feature a fresh anime-cartoon style similar to that seen in the new animated series, Star Wars Resistance, the shorts feature the dialogue, sound effects, and music from past Star Wars films. That’s right: while the cartoons might have bold and flashy colors to attract a younger generation, it will still have the original sound effects from the films, as well as the voice cast of Harrison Ford, Mark Hamill, the late Carrie Fisher, James Earl Jones, and more. The first short is set to debut on Friday, November 30, with five more being released in the months leading up to Episode IX in December 2019. Considering that Episode IX is supposed to draw the Skywalker saga to a close, it seems a fitting way for parents and children to bond over some of the most beloved and iconic moments from the original trilogy. So how do you feel about this new series of animated shorts? Are you excited to see the best moments from the original trilogy remade in cartoon form, and if so, which moments from the films are you hoping will make it into the six shorts? Let us know your thoughts below and, as always, May the Force be with you!